Head down and business as usual for Chris Froome - Top Story. On the race front we have a full EUROTRASH Thursday with reports, results and video from Andalusia, Algarve and Oman. Rider preview from the Abu Dhabi Tour with a bit extra from EF Education First-Drapac, Bahrain-Merida get all dressed up and we go behind the scenes at the Tour of Dubai with Astana. Coffee time. Chris Froome started his 2018 season at the Ruta del Sol stage race on Wednesday in Mijas. At the stage start, before the 197-6 kilometers to Granada, the Sky team bus was mobbed by the media with many questions for the Grand Tour winner. His main point being, "no one wants this resolved more quickly than I do." 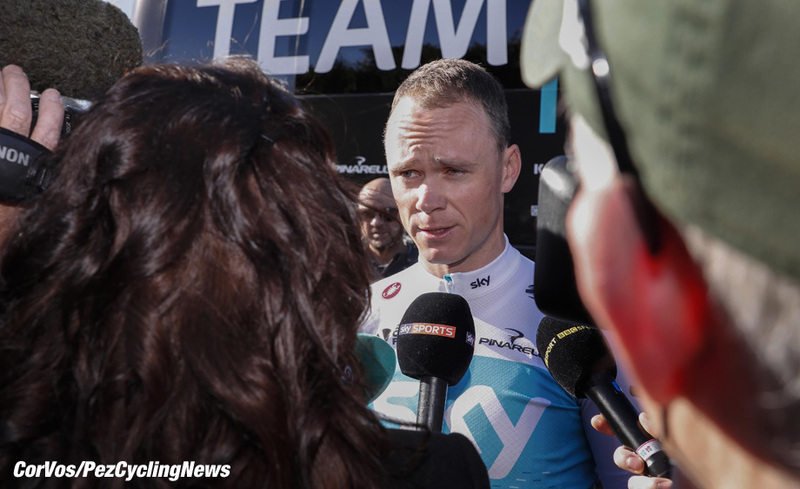 Froome's answers to the many questions were: "We’re in the middle of that process now and there is a process in place for me to demonstrate that I haven’t done anything wrong. I know that I haven’t done anything wrong and that’s what I intend to do, to show that. I think there’s a lot of misinformation out there and also a lot of people out there who don’t necessarily understand the process that’s in place. Obviously it was meant to have been a confidential process. It has been made public now but also a lot of other athletes and riders have been through this process themselves. I’m not asking for the benefit of the doubt here, I’m just asking for a fair process." "I do believe that when all the facts are out there, I think people will see it from my point of view. For sure it’s been tough, for sure it’s been tough. It’s been tough on everyone, but I’ve been really enjoying riding my bike. I’ve been putting in big hours over the winter preparing for the season ahead. Obviously I’ve got quite ambitious goals this year to go to the Giro and the Tour to do as best I can in both of those events. I’m not going to speculate at this time on the outcome of what’s going to happen. As it stands, I’m as focused as ever on the season ahead and I’ll look to be in my best shape for the start of the Giro." So, in Chris Froome's own eyes he is not doing anything wrong and is working within the law, which he is, but is that good for the sport of cycling? No, not really. 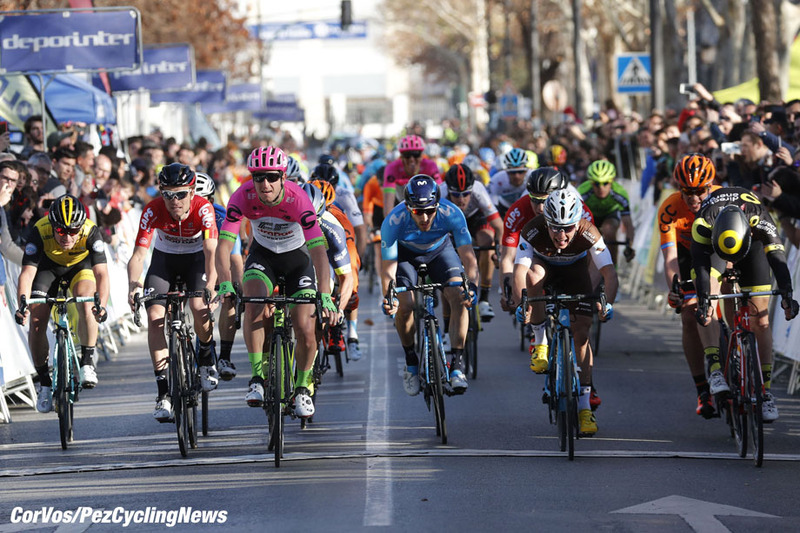 Stage 1 of the Ruta del Sol saw Direct Energie's Thomas Boudat take the day just ahead of Sacha Modolo (EF Education First-Drapac p/b Cannondale) who though he had the win in Granada. Silvan Dillier (AG2R-La Mondiale), Romain Sicard (Direct Energie), Luis Guillermo Mas (Caja Rural–Seguros), Garikoitz Bravo (Euskadi Basque Country), Txomin Juaristi (Fundacion Euskadi) made up the break of the day, but they were all back in the bunch with 14 kilometers to go. The EF Education First team controlled the peloton on the run in to the Granada finish for Modolo, but Boudat snatched the win from under his nose. Stage winner and overall leader, Thomas Boudat (Direct Energie): "I couldn't find a gap to get through in the last meters, but I went for it as best I could. I threw my bike over the line, but it ended up being decided on the photo finish. I was on the other side of the road, and I had no idea I had won. But my director told me to go to the finish to see what was going on, because I could hear my name on the loudspeakers. If the commissaires say I've won, I've won." 2nd, Sacha Modolo (EF Education First-Drapac p/b Cannondale): "I saw the sprint from the helicopter TV shot afterwards, and initially I didn't understand how I could have lost this sprint. I looked round after I crossed the line and saw there wasn't anybody near me but there was no one. Of course I didn't realize Boudat was on the far side of the road." 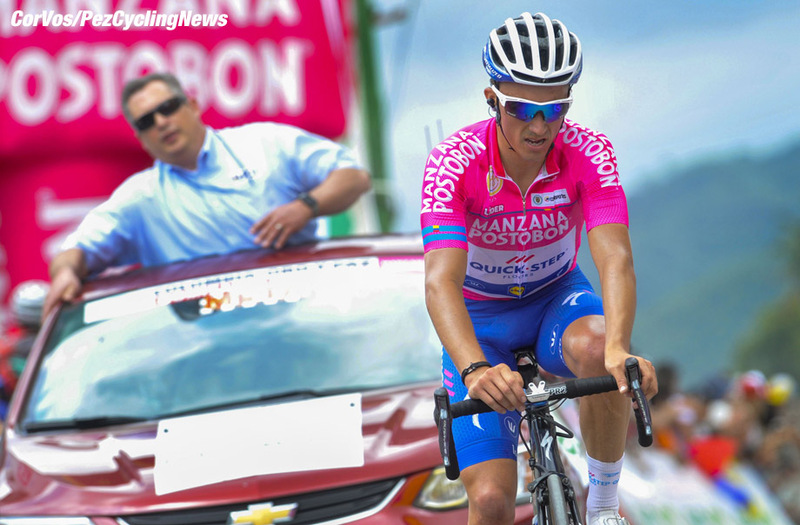 3rd, Clément Venturini (AG2R-La Mondiale): "It was a tiring stage with 3300 meters of altitude gain. With Silvan Dillier in the breakaway, we were able to sit tight in the peloton all day long. Astana decided to kill the breakaway and then the team did the job in the end. It wasn’t actually a sprint that suited me well, so 3rd is encouraging. But I cannot wait to win and reward my teammates for all the work and great job that they have done for me since the start of the season every time there has been a sprint finish. This week is starting well." 4th, Andrea Pasqualon (Wanty-Groupe Gobert): "I had very good legs, but there were many other fast men for the sprint. The last kilometers were nervous, because no team got his train on track, so it was difficult to maneuver in the sprint. I finished fourth, but had legs for a better result. I can actually be happy, because it is only my second competition day of the year. There are still one or two stages that should suit me, because I have legs to go for the victory. Especially the Saturday stage really suits me. The last kilometer is uphill, which reminds me of Coppa Sabatini." KOM, Lluis Mas (Caja Rural-Seguros RGA): "It was a very tough stage, we rode very fast, in fact the peloton was broken when they caught us. This year I marked the beginning of the season and now I am going well. The first goal is Volta a Catalunya and I want to get there at 100%. If I keep this level until the end of the race I will try to win the mountain classification. It’s going to be difficult, especially for the mountain stages, but I will try it." 10. Jan Tratnik (Slo) CCC Sprandi Polkowice. 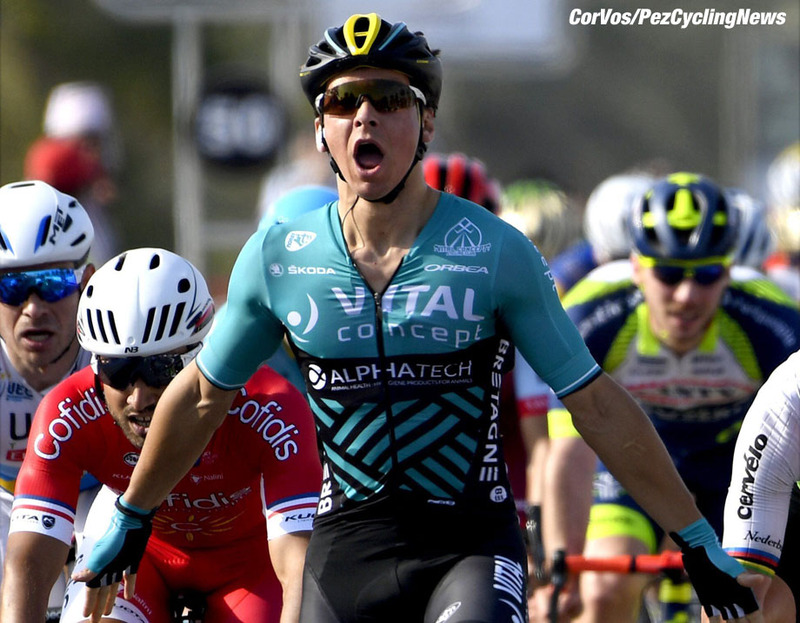 Wednesday saw Stage 1 of the Volta ao Algarve, a stage which was earmarked for the sprinters. For most of the day, a 5-man breakaway group led the peloton but, as expected, the stage came down to a bunch sprint in the town of Lagos, in which Dylan Groenewegen (LottoNL-Jumbo) emerged victorious. Almost right from the drop of the flag, a small group of riders managed to escape from the peloton and establish the breakaway of the day. 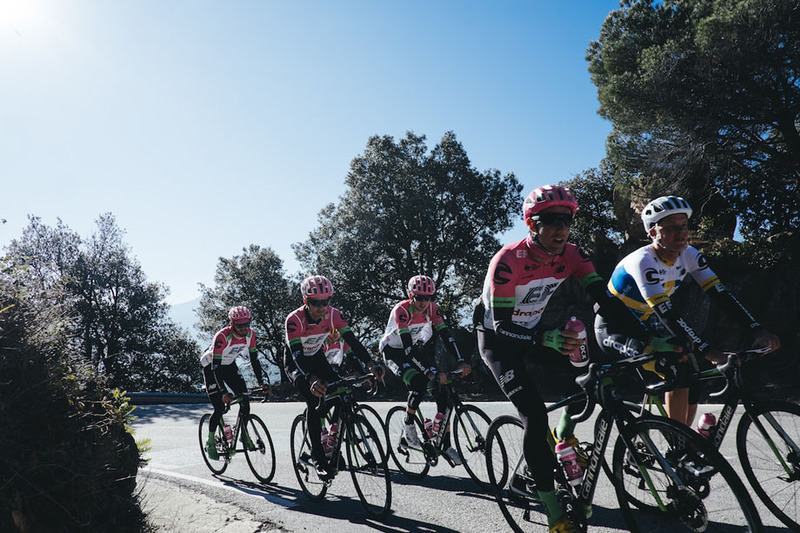 The break consisted of five riders, one from a Spanish team, and the other four from local Portuguese outfits. Gradually building up their lead, they reached a maximum advantage of approximately 3:30 minutes after 44 km. With several quality sprinters in attendance at this year’s race, the teams of the fast men were keen to chase down the break, and began to whittle down the advantage of the escapees following the first intermediate sprint. With 27km left, two riders attacked from the breakaway, yet they were caught by the chasing peloton with 15km remaining. 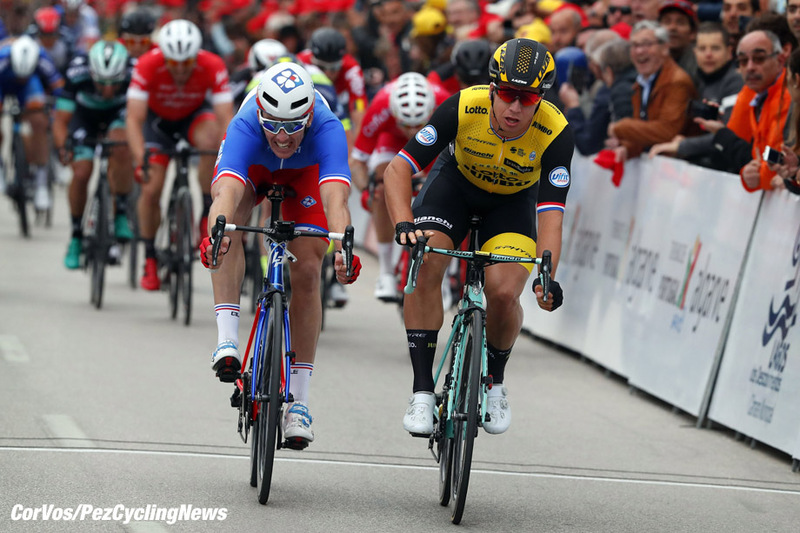 Despite a subsequent flurry of attacks from the front of the peloton in the remaining kilometers, the race came down to a bunch sprint, with Groenewegen taking victory on the line ahead of Arnaud Démare (FDJ), and Hugo Hofstetter (Cofidis) in third. Stage winner and overall leader, Dylan Groenewegen (LottoNL-Jumbo): "The shape feels really good. The lead-out was already strong in Dubai and today they did a great job again. The timing was right and I finished it off in a long sprint." 10. Luis Mendonça (Por) LA Aluminios. Bryan Coquard (Vital Concept) can forget about his early season frustrations - the French sprinter came out on top at the end of Stage 1 of the Tour of Oman to claim his first victory with his new team. 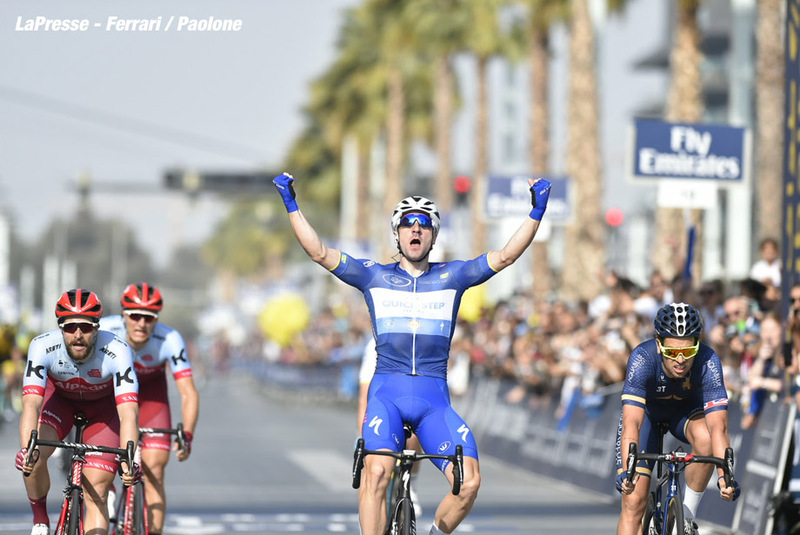 After 162.5km of racing on the beautiful roads of the Sultanate, between Nizwa and Sultan Qaboos University, a Sunny Tuesday saw Coquard storm to victory ahead of Mark Cavendish (Dimension Data) and Giacomo Nizzolo (Trek-Segafredo). He also leads the general and points classifications. A beautiful birthday present for his teammate Kris Boeckmans. The 162.5km stage from Nizwa to Sultan Qaboos University saw an early breakaway of four riders stay away for most of the day. Maxime Farazijn (Sport Vlaanderen-Baloise), Pierre Luc Perichon (Fortuneo-Samsic) Conor Dunne (Aqua Blue Sport) and Brian Van Goethem (Roompot-Nederlandse Loterij) managed to extend their lead to over 3 minutes in the first 100km of the race, but the peloton comfortably controlled the gap to around a minute in the latter stages. As expected, the break was reeled in by the teams who had sprint ambitions with just under 10 kilometers to go, setting up a final sprint. 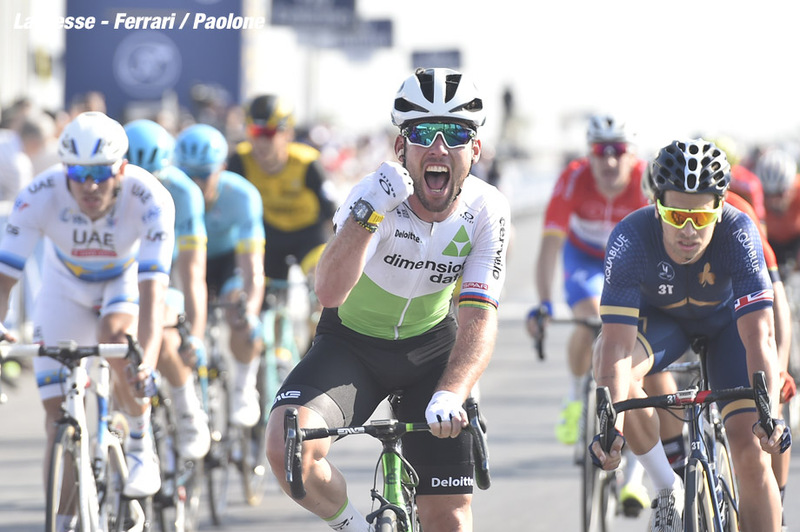 The Dimension Data worked to protect Cavendish through the race and in the last corner, he was placed just outside the top five. He had work to move up into place for the last km. Cavendish claimed second in the sprint behind Bryan Coquard taking the new Vital Concept team's second win. Stage winner and overall leader, Bryan Coquard (Vital Concept): "There are a lot of good sprinters here and I'm very happy to win in front of these big names in sprinting. I have three second places and a third place at the start of the season and I would like to win. On this first stage of the Tour of Oman, it was perfect with a very good lead-out and a perfect sprint from me. I'm very happy." 2nd, Mark Cavendish (Dimension Data): "I said to the guys before just to be there, around about, but don't organize anything for me. I tried to follow Sunweb but it was a bit sketchy. In fact, it went alright but I just started a bit too late. I didn't judge how fast we'd be going in the final, I just started too late." Nic Dougall (Dimension Data): "We just looked after Cavendish and also after Merhawi (Kudus) because we’re looking at him for the GC. In the final we just tried to protect Cav as much as possible but obviously we didn’t have a full sprint lead-out team for him so he was happy to follow the other teams and surf some of their trains so he was in a pretty good position. He did a really good sprint for second. We’re looking forward to the next couple of days which are a bit harder and should suit the climbers a bit more. We’re looking good for the rest of the week." 10. Boris Vallee (Bel) Wanty-Groupe Gobert. 10.Adam Blythe (GB) Aqua Blue Sport. 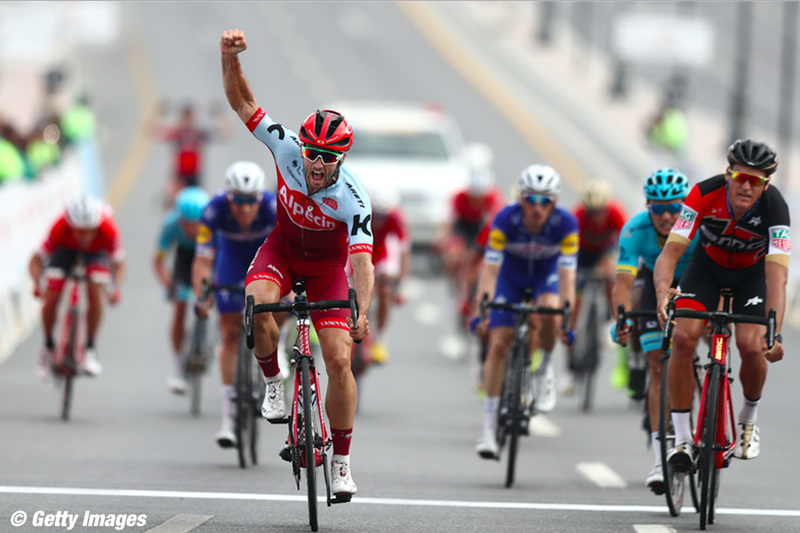 Team Katusha-Alpecin’s Nathan Haas took the victory at the end of a demanding Stage 2 of the 2018 Tour of Oman. The Australian rider out-sprinted a select group of riders at the finish in Al Bustan in front of Greg Van Avermaet (BMC) who finished second and Alexey Lutsenko (Astana) in third. Thanks to the time bonuses, Haas now moves into the overall lead ahead of Van Avermaet (4 seconds) and Lutsenko (6 seconds). 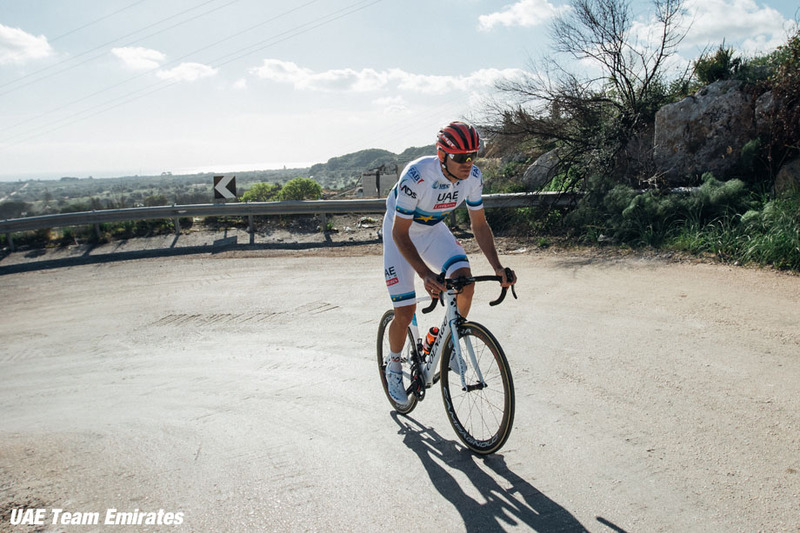 On the last climb of Al Jissah, the final survivor of an early break of four riders was caught. The climbs had whittled down the peloton to 16 riders and Haas sprinted into the overall lead. The 2018 Tour of Oman continues on Thursday with stage three, from German University of Technology to Wadi Dayqah Dam covering 179.5 kilometers – the longest 2018 stage. On Friday the stage finishes on Green Mountain. The race concludes on Sunday. Stage winner and overall leader, Nathan Haas (Katusha-Alpecin): "Today my team, Katusha-Alpecin, was just amazing. It was the first time in a long time that I just had to sit and not to think. They guided me to where I got to do my thing. Last year I was already fifth in this stage when we finished at the top. Today there was a different kind of speed. I decided to lock onto the wheels and just forget about the next part, which was the sprint. So there were two finish lines: the top and then down the hill. I did some research to watch the race. I’ve realized I’m not one of the phenomenons of cycling, so I have to be a little bit smarter or to be just more prepared. I knew I actually had to come a little bit from the back in the sprint. I’ve put a little bit of Fabian Cancellara’s earlier work (2015) into what I did today. I think I am climbing a bit better than I was last year. I am a little bit lighter and my bike is awesome. I’m gonna fight till the end, whether or not I can hold the red jersey or maybe even get on the podium. This is cycling. You can do pretty special things when you are in front." 10. Miguel Angel Lopez Moreno (Col) Astana. 10. Fabien Doubey (Fra) Wanty-Groupe Gobert. The cycling world's top names line up for the only Middle Eastern race in the UCI WorldTour calendar. With just seven days until the Abu Dhabi Tour starts the entry list is announced, with key riders’ extended biographies. Born in Póvoa de Varzim, Portugal, 5 October 1986, Rui Costa is an all rounder with an impressive palmarès that includes the 2013 UCI Road World Championship, three stage wins at the Tour de France and three General Classification victories at the Tour de Suisse, along with numerous one-day podiums. 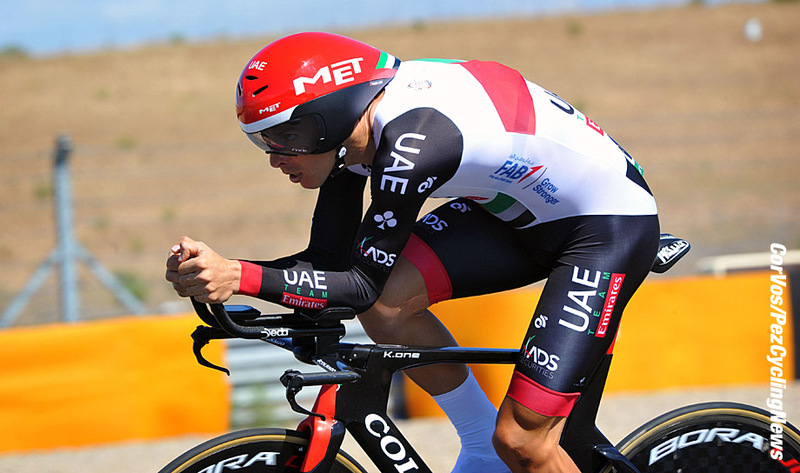 Last year Rui Costa won the Jebel Hafeet stage and the General Classification at the Abu Dhabi Tour. Cavendish was born on 21 May 1985 in Douglas, Isle of Man (British Isles). 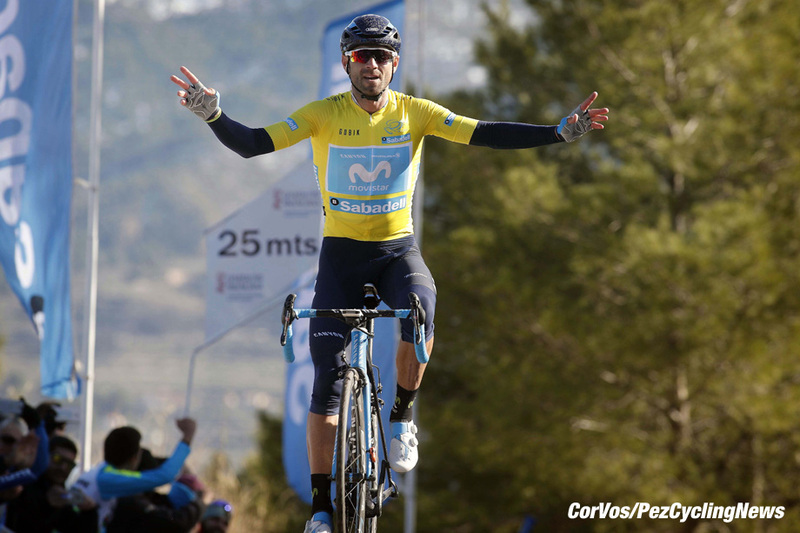 “Cav” has won 15 stages at the Giro d’Italia, a mighty 30 at the Tour de France, and three at the Vuelta a España. In 2011, in Copenhagen (Denmark), he became UCI Road World Champion, and boasts one-day-race successes such as Milano-Sanremo (2009) and the National Road Race Championships. In 2016 Mark won the gold medal with Bradley Wiggins in the Madison at the Track World Championships; he took the opening stage of the Tour de France in a sprint finish at Utah Beach and put on the maillot jaune for the first time; then he won the silver medal at the Rio Olympic Games in the Omnium. Cavendish has won three stages and two consecutive Green Jerseys at the Abu Dhabi Tour. 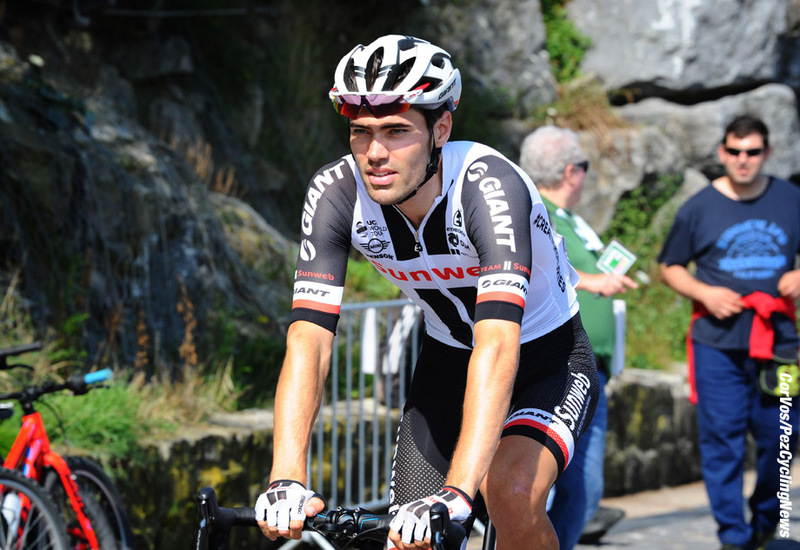 Born in Maastricht, Netherlands, 11 November 1990, Dumoulin found notoriety in his early career as time trial specialist before emerging as a great all-rounder. Last year he became the first Dutch cyclist ever to win the Giro d’Italia and, later that season, both the World individual men's time trial and the World team time trial Championships. His palmarès features stage wins in all three Grand Tours (three at the Giro d’Italia, two each at the Vuelta a Espana and the Tour de France), and a silver medal at the Rio’s Olympic Games. With the addition of a time trial to this year’s Abu Dhabi Tour, and considering his good climbing skills, Tom is one of the biggest favorites for the General Classification. Valverde, born 20 April 1980, is one of the most successful riders in the peloton with 90 pro wins since his debut in 2002 with the Kelme - Costa Blanca team. His palmarès includes four Liège-Bastogne-Liège (2006, 2008, 2015, 2017) victories, five at La Flèche Wallonne (2006, 2014-2017), nine stages and one GC at the Vuelta a España and two editions of the Clasica Ciclista San Sebastian (2008 and 2014). Last year El Bala (‘The Bullet’) was out for almost six months after suffering a broken kneecap sustained in a Tour de France crash. He has already claimed a victory in 2018: stage two at the Volta a la Comunitat Valenciana. 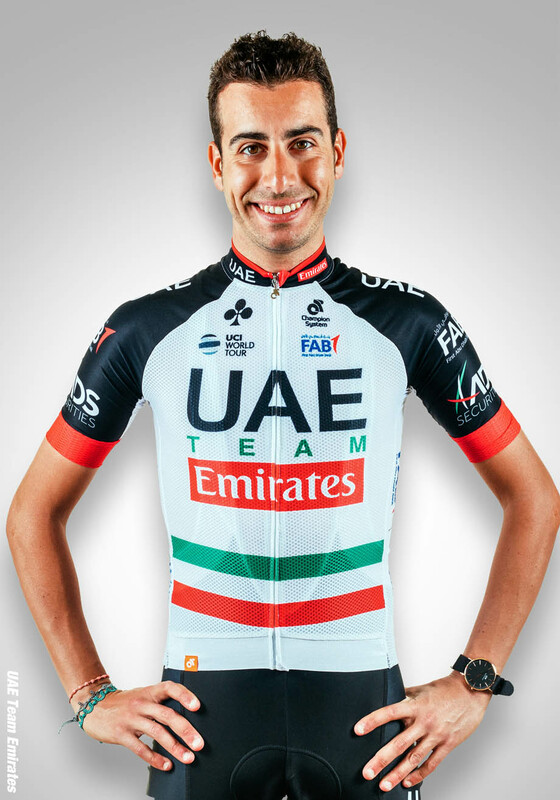 Born in San Gavino Monreale, a town in Sardinia, Italy, 3 July 1990, Fabio Aru is a climber and the overall winner of the 2015 Vuelta a España. He took to the Giro d’Italia podium in both 2014 and 2015, and was runner-up in the General Classification at the inaugural Abu Dhabi Tour. Last year, Aru wore the Tour de France’s Yellow Jersey for the first time and got a stage win at La Planche des Belles Filles. This is his first season with the UAE Team Emirates. Miguel Ángel López was born February 4, 1994 in Pesca, Colombia. He is one of the most talented riders in the peloton. Since 2014 he has won the 2016 Tour de Suisse, two stages at the 2017 Vuelta a España and the 2016 Milano-Torino. 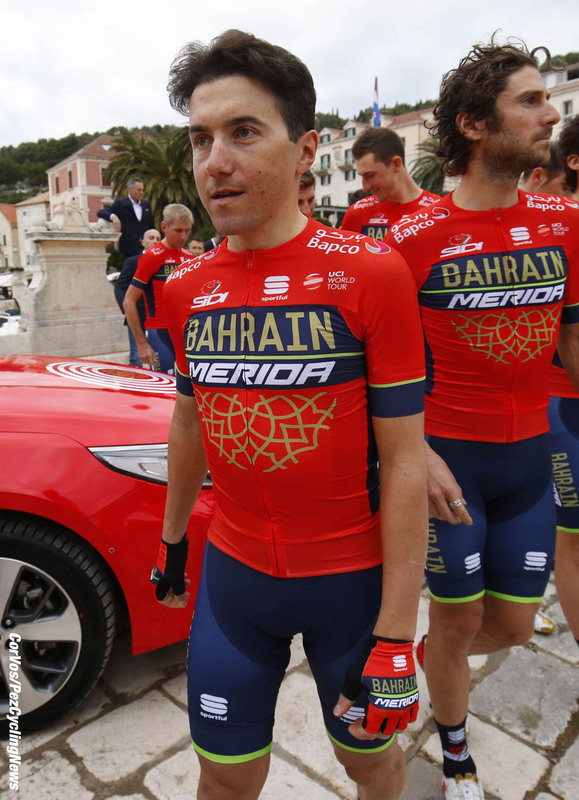 A highly experienced rider from Policoro, Italy, born 30 November 1982, Pozzovivo is a pure climbing specialist. His achievements include a stage at the 2012 Giro d’Italia and the General Classification at the Giro del Trentino the same year. Born 11 June 1992 in Saint-Amand-Montrond, France, Alaphilippe is one of the riders to watch in the 2018 season. Since 2015 he won the General Classification at the Tour of California (2016), one stage at the Vuelta a España (2017) and was runner up at Il Lombardia (2017), La Flèche Wallonne (2015 and 2016) and Liège-Bastogne-Liège (2015). At last year’s Abu Dhabi Tour Julian was the winner of the White Jersey for Best Young Rider. 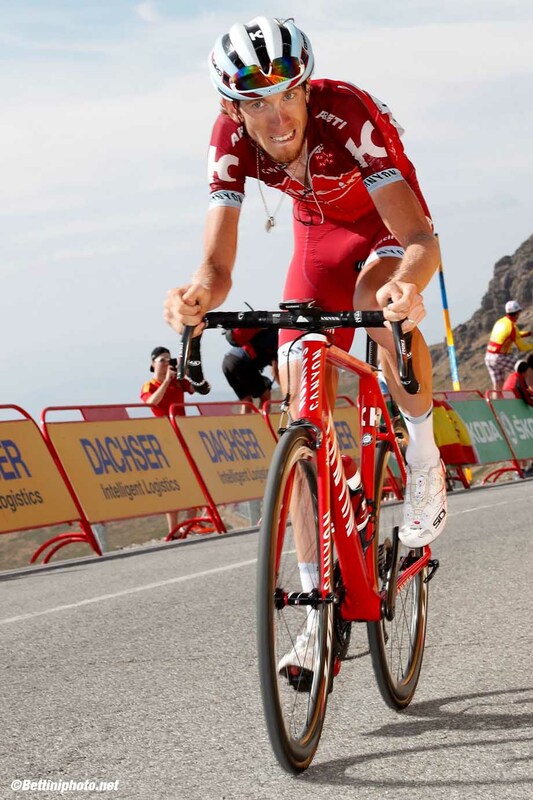 Born on 15 September 1989 in Naberezhnye Chelny, Russia, Zakarin is a talented all rounder who has won a stage at the 2015 Giro d’Italia, one at the Tour de France a year later and the National Time Trial Championship twice. Ilnur was runner up at 2017’s Abu Dhabi Tour. Kristoff, born 5 July 1987, is current UEC European Road Champion and his biggest victories are the 2014 Milan-Sanremo and the 2015 Tour of Flanders. His palmarès includes two stages at the 2014 Tour de France and two national Road Race Championships (2007 and 2011). At last year’s UCI World Road Championship in Bergen, the Norwegian finished second behind Peter Sagan. Born on 11 May 1988 in Arnstadt, Germany, and a professional rider since 2011, Kittel’s palmarès includes 86 victories, with one stage at the 2017 Abu Dhabi Tour alongside 19 Grand Tour stage wins (four at the Giro d’Italia, 14 at the Tour de France – five of them being in the 2017 edition – and one at the Vuelta a España). 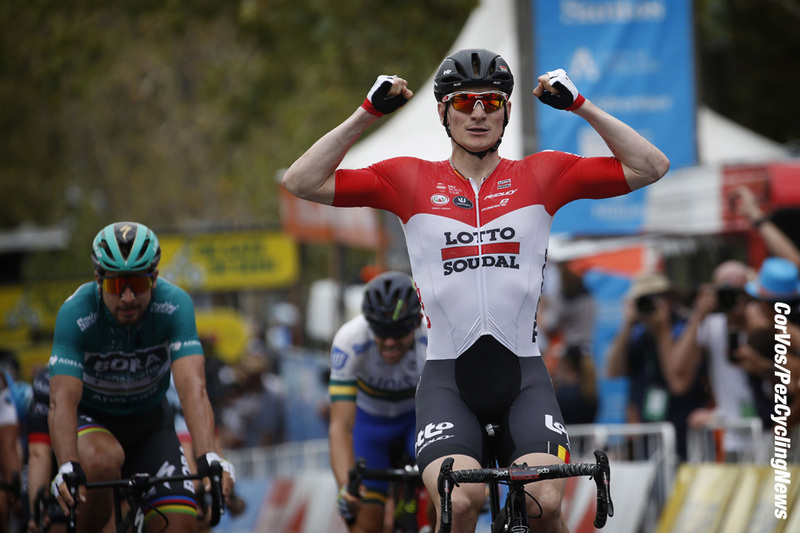 Greipel, born in Rostock, East Germany, 16 July 1982, is one of the best sprinters of his generation, with a powerful physique which has earned him the nickname “The Gorilla”. He has won 11 stages at the Tour de France (2011-2016), seven Giro d’Italia stages (in five different editions), and four at the Vuelta a España. André has won the Tour Down Under GC twice, in 2008 and 2010. Of his 149 wins since turning professional, two of them came this January, the first and sixth stages at the Tour Down Under. Born in Sydney, Australia, 11 June 1994, Ewan is a talented sprinter who claimed 11 professional victories in his first season, including a stage at the Vuelta a España on his Grand Tour debut. Caleb was in superb form in 2017 too, having won four stages at the Tour Down Under, a stage at the 100th Giro d’Italia, three at the Tour of Britain and the final stage at the Yas Marina Circuit in the Abu Dhabi Tour. 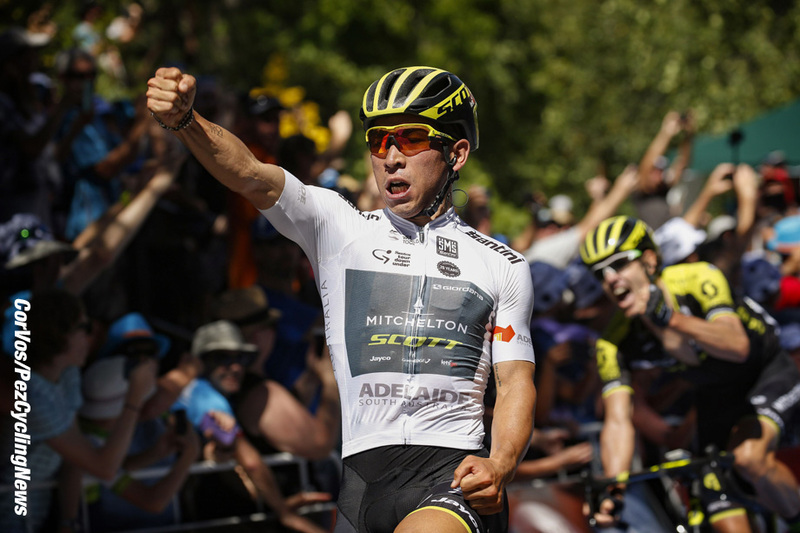 In 2018 he has already won the second stage of the Tour Down Under. Viviani, born 7 February 1989, is one of the most accomplished sprinters in the peloton, having claimed 50 victories since turning pro in 2010. As well as being a talented road rider, Elia also has an admirable record on the track: five gold medals in the European Track Championships (Points Race in 2012 and 2013, Madison in 2014, Omnium in 2014 and 2015) and, in 2016, the gold medal at the Rio Olympic Games in the Omnium. In 2015 he won the Abu Dhabi Tour’s second and fourth stages and wore the Red Jersey as leader of the GC for one day. Last year’s wins include the Bretagne Classic - Ouest-France, and the Cyclassics Hamburg. Elia has already claimed few victories in 2018: stage three at the Tour Down Under and stage two, five and the General Classification at the Dubai Tour. EF Education First – Drapac p/b Cannondale makes its Abu Dhabi Tour debut with a well-rounded squad focused on stage wins. Lawson Craddock, Kim Magnusson, Taylor Phinney and Mike Woods will start their seasons in the UAE. They are joined by Dan McLay, Dani Moreno and Pierre Rolland. 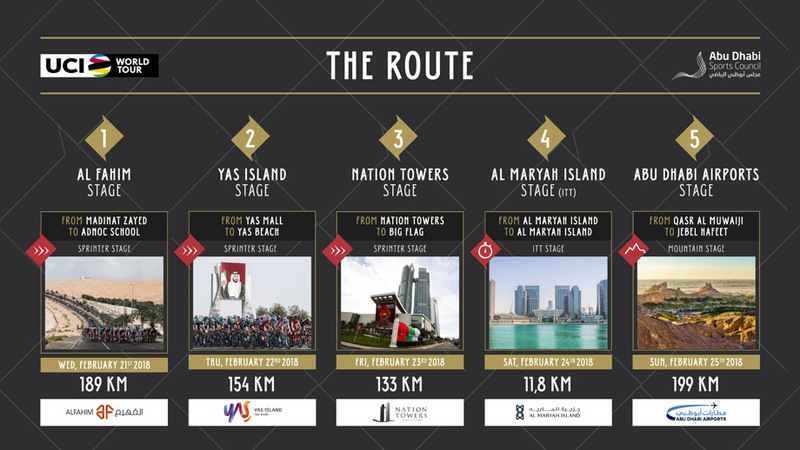 The fourth edition of the Abu Dhabi Tour runs from Wednesday February 21 – Sunday February 25. The race caps off a three-week period of Middle Eastern racing that began with the Dubai Tour followed by Tour of Oman. The Abu Dhabi Tour is the newest of the three races, the only one to boast WorldTour status. It's owned and operated by A.S.O, who run, among other races, the Tour de France. Woods will have his chance on the steep slopes of the final stage. Phinney will focus on the penultimate stage time trial. Dan McLay will fly the #PinkArgyle flag in the sprints. “We have a number of options for stage success, which is something I’d like to see more than a general classification result – although I certainly don’t consider the two mutually exclusive,” said Southam. “We’ll support Dan to the absolute maximum in the sprints. Even if we don’t have a full dedicated lead-out train, he can be there. That boy can find a gap alright. Weather conditions often play a role in the race action in the Persian Gulf. The now defunct Tour of Qatar was regularly decided by echelons formed on windswept roads. A sandstorm forced the cancellation of one stage of the 2017 Dubai Tour and wreaked havoc on another. Lawson Craddock (USA), Kim Magnusson (SWE), Dan McLay (GBR), Dani Moreno (ESP), Taylor Phinney (USA), Pierre Rolland (FRA), Mike Woods (CAN). 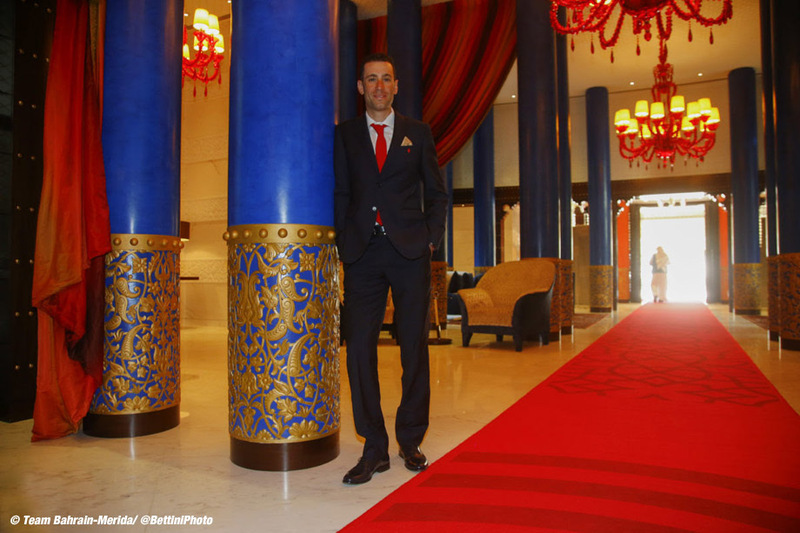 Bahrain Merida Pro Cycling Team athletes and management keep looking elegant and stand out on every formal and special events thanks to the elegance of the formal outfits designed by Lebole. The partnership agreement between Team Bahrain Merida and Lebole – the Italian leading company provider of elegant men’s clothing - has been renewed for a second successive year, assuring the elegance of the team for 2018 too. Lebole will still be official supplier of the formal clothing to dress in style athletes and management of the team led by Vincenzo Nibali. As it happened recently when the Shark and some teammates were honored to attend the annual gathering at the Royal Court in Manama, Bahrain, at the presence of His Highnesses Sheikh Nasser, of international media, Bahraini authorities and partners of the Team. In this as in other special occasions outside racing, our riders can be sure to fashionably stand out dressing the formal outfit designed by Lebole. High-quality fabric and craftsmanship, with the attention to details are the main values of the creations of this internationally renowned brand that is synonymous with elegance and Italian style for more than fifty years. Go behind the scenes at the DubaiTour with the Astana team and see the race through the eyes of the riders.